PCI Collection – Package Containers, Inc.
With the PCI Collection you can merchandise your fresh produce year round with 12 months of colorful bags that hold up to 25 pounds. These “family size” bags promote bulk buying and feature custom artwork and recipes along with your brand logo and messaging. 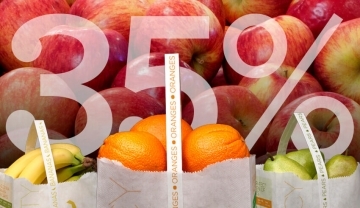 Produce Sales Go Up, Spoilage Decreases. Bright, colorful and fun. Our playful designs attract attention. PCI is the only bag manufacturer who can print on the bag handle, the one spot your customers are sure to look. Recipe ideas to help merchandise companion products throughout the store.